Hey, it's Ben here again. I want to thank you once again for being a key part of the movement. To thank you, I'm giving you one of my Metabolic Mayhem® fat blasting workouts. Free. No charge. Even though it's only a very small piece of Metabolic Mayhem®, I know you'll love this science-based workout. I'll be completely honest with you though, it's hard. Become a fan of us on Facebook to get all sorts of extra bonus info, get your questions answered, and be the first to learn about special events! Click the "like" button below! Download the workout by clicking the link below. Read thorugh it, and put it to work for you. Shoot an email to ben [at] metabolicmayhem [dot] net and let me know what you think! 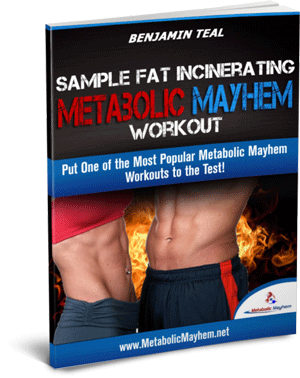 Click Here to Continue to Metabolic Mayhem®.